Joe Biden seems likely to run for the Democratic presidential nomination and to be a formidable candidate if he enters. But we’ve been waiting for the former vice president to officially jump into the race for a while now, so … how will the Democratic primary look if Biden opts not to run? Or what if his candidacy implodes because of a tendency to make verbal gaffes, behavior that ranges from odd to creepy, or some other reason? That said, the difference in results without Biden is interesting a couple of ways. First, even though Sanders is positioning himself as one of the most liberal candidates in the race and Biden is likely to be cast as one of the more conservative ones, it’s not clear that Democratic voters are seeing those two as representative of different ideological poles within the party. According to polling from Morning Consult, Sanders is the second choice for many Biden voters, and vice versa. That Sanders gained 10 percentage points in the Change Research poll when Biden was not included also suggests that some voters are choosing between those two. Again, that finding could simply reflect that Sanders is the only candidate besides Biden who most Democrats are really familiar with. But it’s also worth considering that voters, at least at this stage, either might not know or might not care about the various candidates’ policy differences, which may already be well-known to party activists and journalists. As we’ve written, and as political science research has shown, the “lanes” that journalists and activists take for granted are often hard to find among actual voters. Secondly, this survey gives you a sense of the field if Biden either chooses not to run or — in a more likely scenario at this point — runs but isn’t a great candidate.2 Which candidates might benefit from Biden flaming out? The Change Research poll suggests that the answer is “basically all of them” — from those on the left (Sanders, Warren) to those closer to the center (Booker, O’Rourke). Men would benefit (Buttigieg, Sanders), but also women (Harris, Warren). The other candidates have every reason to be wary of a Biden run — he would almost certainly enter the race as the polling front-runner. But Biden has plenty of reasons to be wary too. He has never been a particularly good presidential candidate, and unlike in 2008, when he was a long shot, he is a real threat to others in the field. So other candidates — or maybe all of them — will probably be looking for ways (either publicly or behind the scenes) to take him down. 58 percent of Republicans in South Carolina said they want the state to hold a GOP primary next year, while 24 percent said a primary is not needed if President Trump is running for reelection, according to the Change Research survey. South Carolina Republican Party officials have said they are considering canceling the primary. Sanders (26 percent) and Biden (23) lead the Democratic field in Massachusetts, according to an Emerson College survey. Bay State Sen. Elizabeth Warren is in third place (14). Among Republican respondents in the same poll, Trump had a big lead (82 percent to 18 percent) over former Massachusetts Gov. William Weld, who has launched an exploratory committee for a potential primary challenge to Trump. Biden also leads in California (26 percent), with Sanders (18) and the Golden State’s Harris (17) also in double digits but behind Biden, according to a Quinnipiac University poll. 35 percent of Democrats said they agreed with the statement that Biden is “not progressive enough to make the changes Democrats need,” according to a Morning Consult/Politico poll; 50 percent of Democrats said they disagreed with that statement. In the same poll, 54 percent of Democrats agreed with the statement that Biden is “the Democrat with the best chance to defeat President Trump,” a sentiment that 30 percent of Democrats said they disagreed with. About 63 percent of Americans believe the legacy of slavery affects black Americans today either “a great deal” or “a fair amount,” according to a Pew Research Center survey. There are considerable racial and partisan divides on this question. 56 percent of Americans think Trump should release his tax returns to the public, compared with 27 percent who think he should not, according to a new HuffPost/YouGov survey. Virtually all Democrats (81 percent) said Trump should release his tax returns, as did a sizable share of Republicans (31 percent). 58 percent of Americans think the Democratic presidential candidates should release their tax returns, compared with 23 percent who think they should not, according to the same survey. Ocasio-Cortez’s constituents agree with her on policy goals like “Medicare for all” (75 percent said they were in favor of it) and free tuition at public colleges (76 percent). But they favored (58 percent) a deal to give Amazon some tax incentives in exchange for moving more of its operations to New York, a proposal that Ocasio-Cortez opposed. According to FiveThirtyEight’s presidential approval tracker, 41.9 percent of Americans approve of the job Trump is doing as president, while 52.8 percent disapprove (a net approval rating of -10.9 points). At this time last week, 42.1 percent approved and 52.6 percent disapproved (for a net approval rating of -10.5 points). 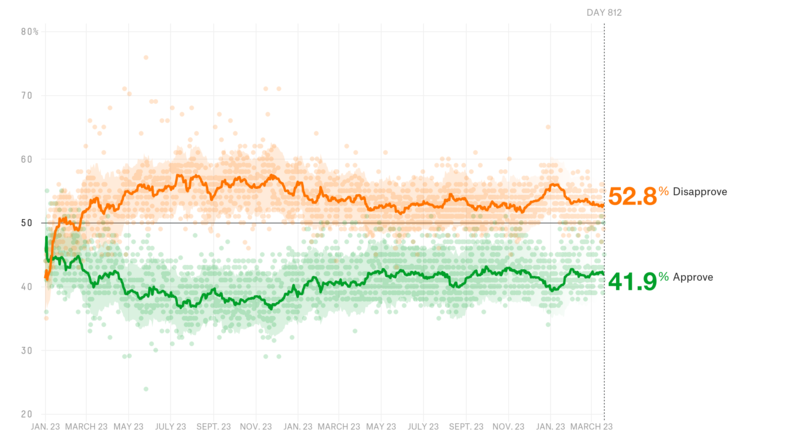 One month ago, Trump had an approval rating of 41.7 percent and a disapproval rating of 53.4 percent, for a net approval rating of -11.7 points. CORRECTION (April 16, 2019, 9:30 a.m.): An earlier version of this article incorrectly spelled Siena College. Specifically, former Georgia House Minority Leader Stacey Abrams, Colorado Sen. Michael Bennet and former Virginia Gov. Terry McAuliffe. U.S. Rep. Eric Swalwell of California was also excluded; he had not entered the race at the time of the poll. The latter scenario is entirely possible. It happened in 1988, when Biden dropped out of the presidential race amid accusations of plagiarism, and in 2008, when he didn’t win a single delegate.